There are 2 main ways that we can cultivate a relationship with God. One is through prayer (this was a clear struggle for me), and the other is through reading his revealed word, the Bible. Another way is through reading great books by faithful, Christian authors. One that I would highly recommend for the Christian wanting to grow in prayer is called “The Valley of Vision: A Collection of Puritan Prayers and Devotions.” This was given to me as a gift by a sweet friend of mine. 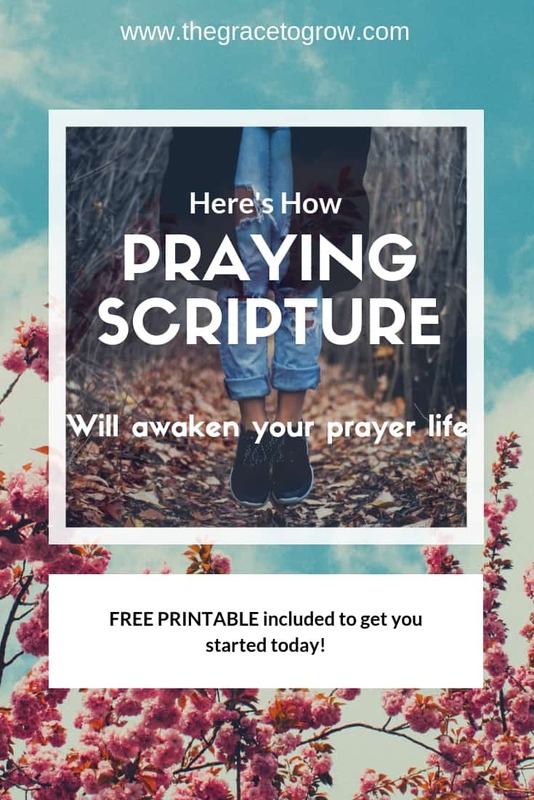 The prayers in this book are just soaked in scripture, and are so helpful to the struggling prayer. 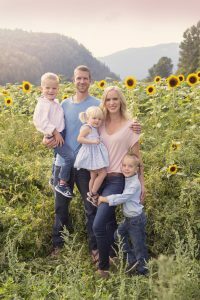 I struggled with prayer, and I can’t say why. To me, it felt as if my prayers were bouncing off the walls and ceilings and going nowhere. In fact, bouncing is probably too lively a word. I felt as if my prayers went nowhere. That was the reality. The words seemed to die the moment they left my lips. But for every failed prayer, I had a moment in the word where it felt like God was speaking to my heart. His spirit stirring me. 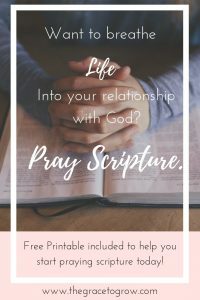 The paradox between my prayer life and my “Bible life” was confusing to me. I didn’t understand how God could feel so far in prayer, and so close in his word. So, what I felt was true. 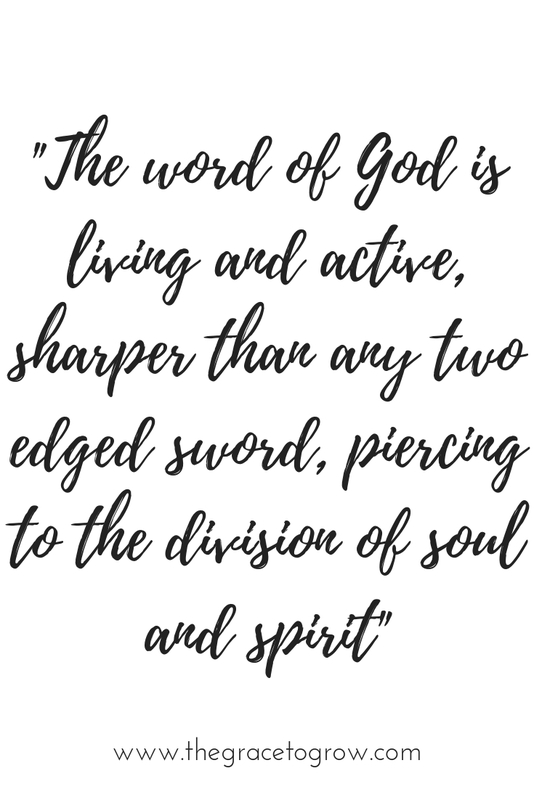 God’s word really is alive, and it certainly does cause his spirit to not only stir within me, but to pierce the division of soul and of spirit. The Lord knows my heart, and yes, does he hear my prayers. Even more, he sees me. God sees me… my soul is naked and exposed before him. Wow. So now I knew for sure that God was not the problem. When it comes to prayer, I was (and still sometimes am) the problem. 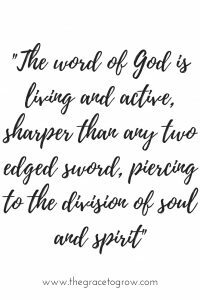 It became apparent it was time to start using this living, active sword, to breathe life into my prayer time. 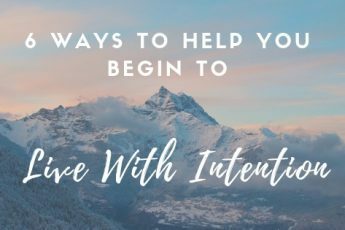 Check out this related post, all about living with intention! I wrote out some scriptures on sticky notes and stuck them to my bedroom wall. I chose each scripture intentionally. The scriptures I chose contained words I wish I had come up with and thought to pray all by myself. Each scripture that I chose poked at a part of me that needed improvement. 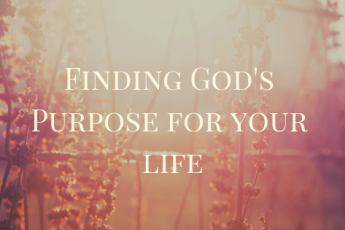 This included things like gratitude, patience, prayer, listening to God, holding fast to the gospel instead of floating along with the culture… I struggle with all of these things and more. Kneeling down on the floor (also new in my prayer life), I faced those post it notes on my wall and began to pray. It felt awkward praying with my eyes open, staring at my messy printing on fluorescent squares. I struggled to make the words into a personal prayer. I stumbled over words, and though no one was watching, I was embarrassed. Failure. We all know that feeling, and I felt it acutely in that moment. But I didn’t spend all that time writing scripture on sticky notes to give up after just experimenting one time. The next day, I knelt again and began to pray. What happened next was amazing. Though there was some awkwardness and stumbling, the words flowed smoother. The words seemed to jump off the paper and echo throughout the room. The holy spirit was working. As I knelt there, praying scripture, tears gathered in my eyes and began to fall down my cheeks. Gospel truth was convicting me and soothing me, all at once. The inspired word of God had opened up the gates, and praying was, for the first time in a long time, not a struggle. If you’re struggling with a prayer life that’s in desperate need of resuscitation, I want you to experience this “coming alive” feeling. Jesus didn’t get crucified, and the curtain of the temple wasn’t torn in two so that we should remain distant from God. No, that curtain was torn in two to allow us to draw near to our Savior and creator. There are countless examples in the Bible of how to pray, what to be thankful for, what to pray towards and what to pray against. God doesn’t want us out there, drifting on our own. Take the word that he has given us and use it to know him. Read it, whisper it, shout it, pray it. Praying scripture has become a gift to me. There are times when I feel like passion and intention fade in my faith. I know that the word is there to be prayed, and that it will pull me up and out. 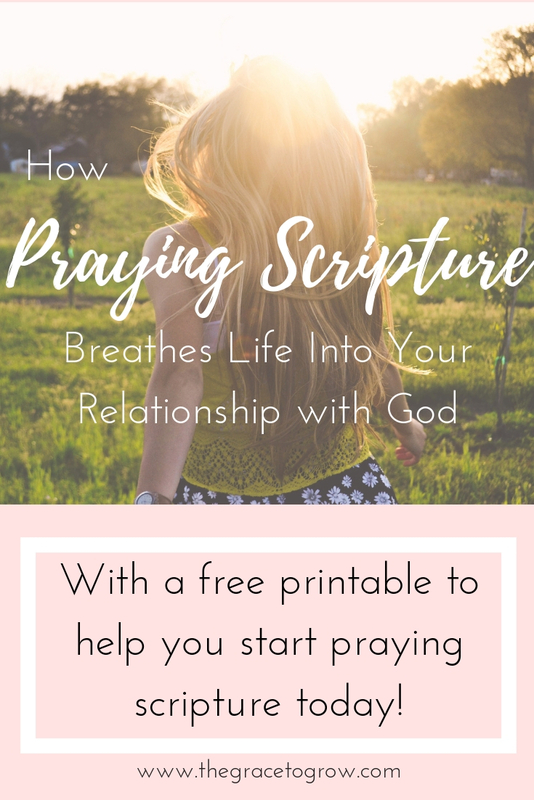 I have created a free printable to get you started praying scripture. As you grow in this practice, you’ll add scripture on your own. The Bible is full of powerful words to pray. 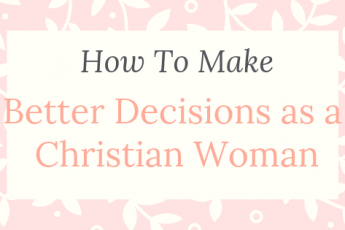 This list is a springboard for you to begin with. Where it goes from there is up to you. 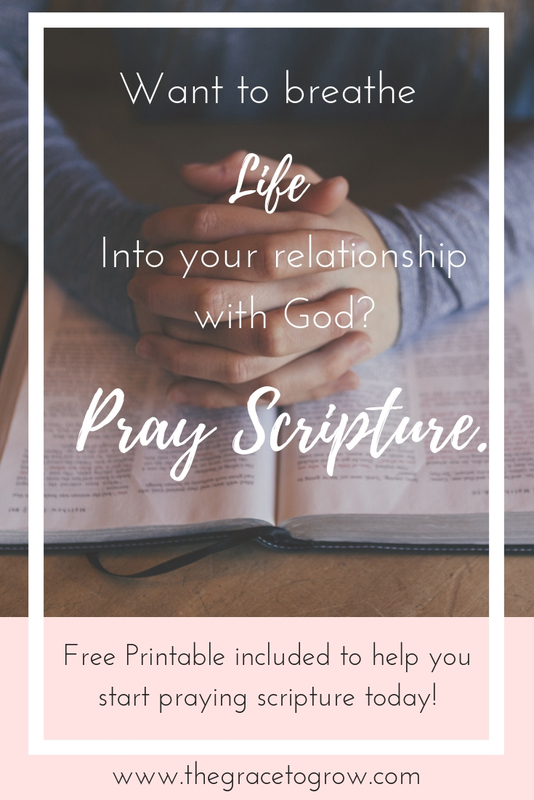 Subscribe here and then hop over to your inbox to grab your free, printable scripture guide! If it doesn’t land in your inbox, check your ‘junk’ folder! Far from junk… but you know how computers can be! I’m looking forward to getting to know you! Grab your "Praying Scripture" Freebie! 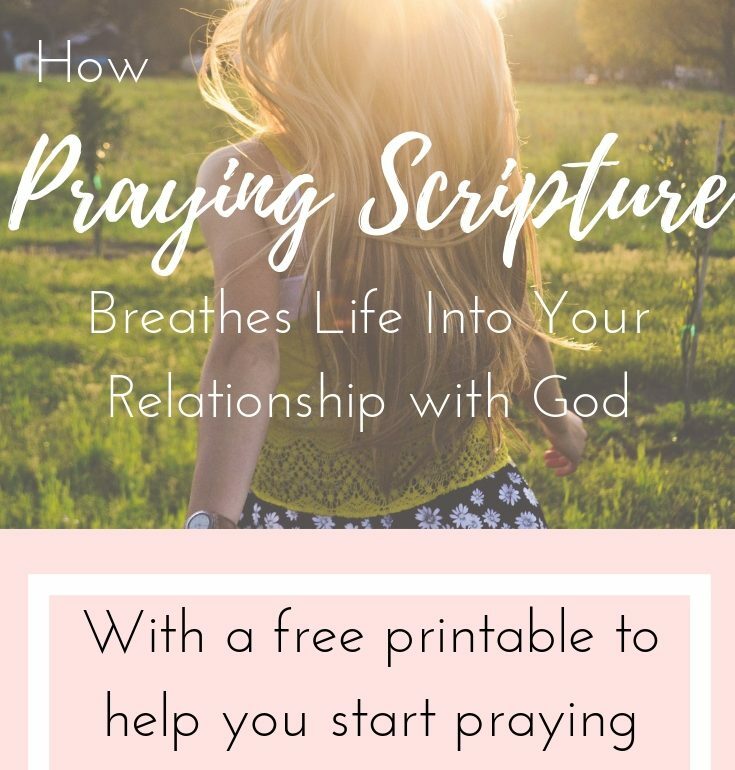 Subscribe here and then grab your "Praying Scripture" print-out! 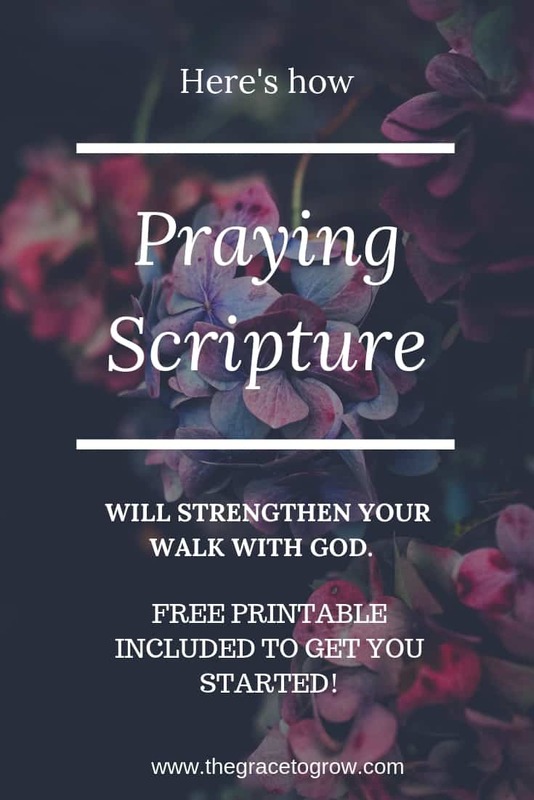 How praying scripture can bring you closer to God and enrich your prayer life! 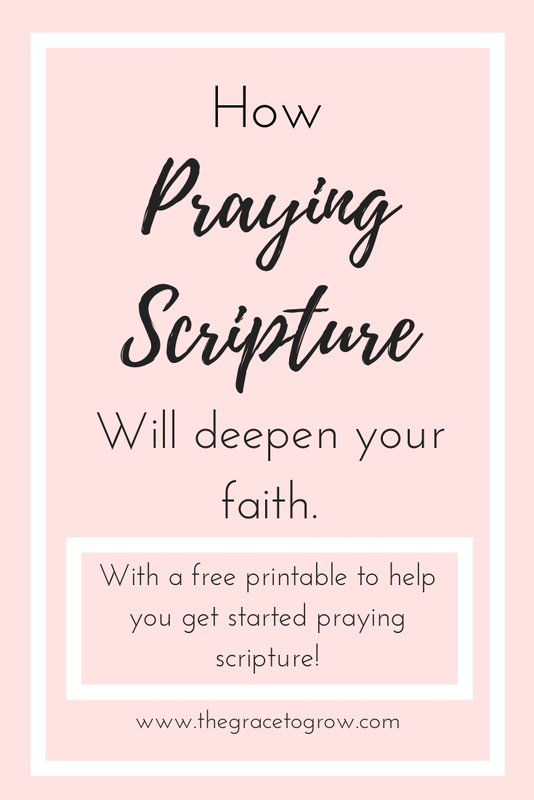 Free printable included to help you get started praying scripture! Thanks for your honesty on what led you to this discovery! It’s so true that God’s words are living, so they never grow old. I’m amazed at how these ancient scriptures find space and take root in our hearts! Praying the scriptures really does allow God space to show us more! Yes, I feel the same! These ancient words feel more and more relevant all the time! I too have found that praying scripture can strengthen your walk with God. 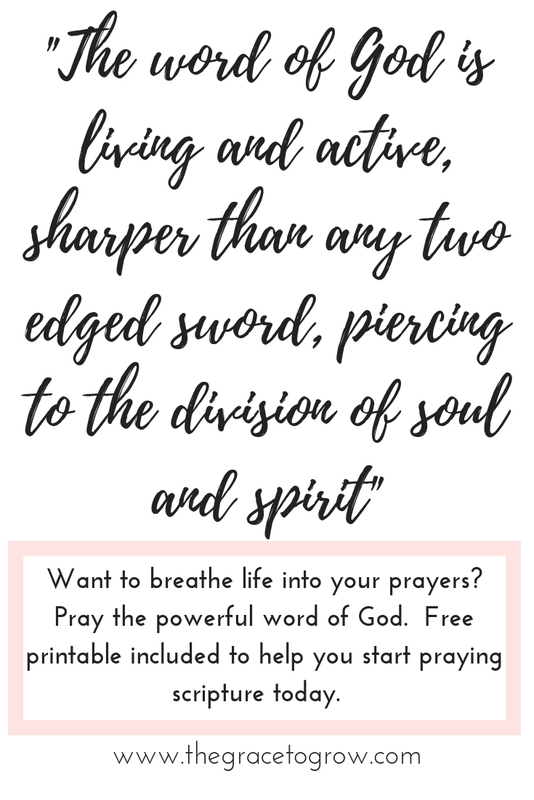 I especially identify with having felt “the paradox between my prayer life and my Bible life.” These are great, we’ll-thought-out tips. Why I Don’t Deserve to Write About Jesus.